Materials: alpha-BBO, Calcite, Quartz or YVO4 single crystal. e-ray transmits with a displacement. ​ High extinction ratio (> 100,000:1) over specified range of wavelength. ​ a-BBO dispacers are protectively coated, calcite/YVO4 are uncoated. Anti-reflective (AR) coatings are available upon request. * Calcite crystal is a natural mined material, not synthetic material. Defects in a calcite crystal (a large and thick crystal in particular) can cause scattering and absorption within the bulk. The displacements are wavelength dependent as a result of the dispersion of material indices. 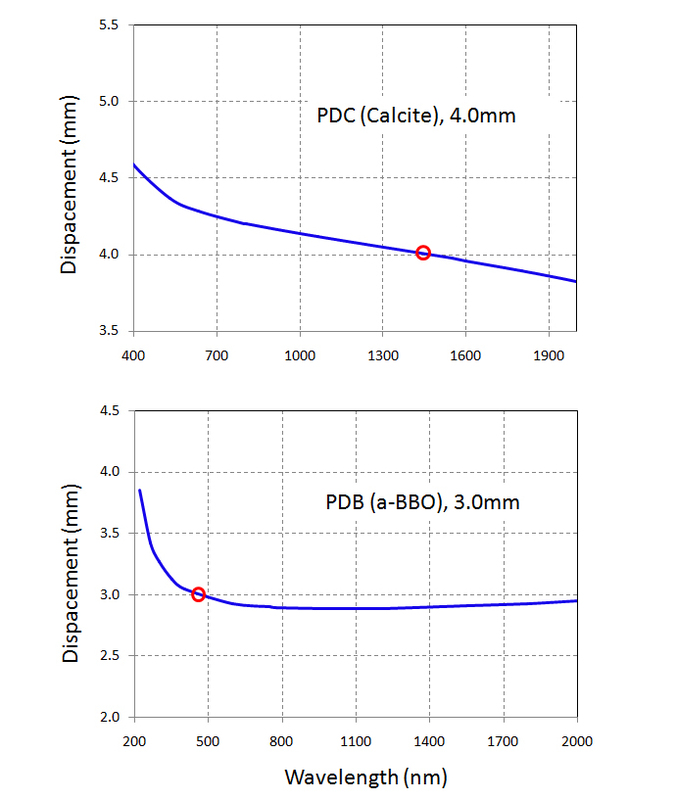 The specified displacements are defined at 1550nm for PDC (calcite) and PDY (YVO4), and at 405nm for PDB (a-BBO). Unless the coating is specified, PDB (a-BBO) is coated with single-layer MgF2 protective coating (P-coating) to prevent moisture from the polished faces, PDC (calcite) and PDY (YVO4) are uncoated. Input and output faces can be AR coated with R<0.25% at the specified central wavelength. For the inquiry, please specify the coating and append to the part number, e.g. PDC1040-AR800 for the calcite beam displacer with the AR coating @ 800nm. The standard polarizing displacers are mounted in an OD 1" anodized aluminum (Al) mount. Unmounted displacers or custom mounts are available upon request.